I'm guessing at the overly 'wordy' rating? 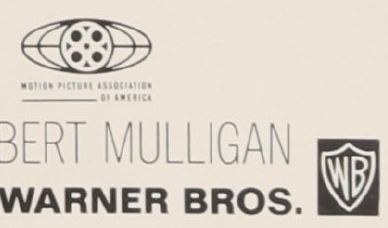 Shouldn't it be 'Not Suitable For Children' or 'Suitable Only For Adults' as per Shotgun Wedding and Once Upon A Time In The West Daybills currently in Bruce's auction? Spot on Wil. 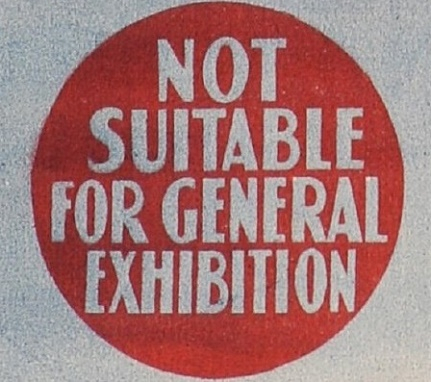 The 'Not suitable for general exhibition' censorship rating appearing on the two posters in discussion ceased being used in 1948 in Australia when in was replaced by the 'Not Suitable for children' rating. 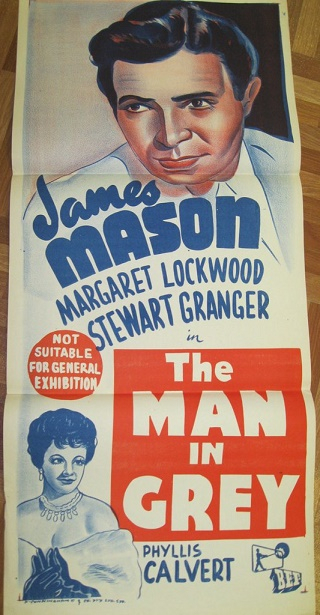 A mistake was made by uslng the old classification wording on the two posters of The Man In Grey ( 1943 / but this poster a 1953 re-release ) and The Devil's Eight ( 1969 ). I have a feeling there may be one or two more examples where this also happened with an old classification was used also, but they don't readily spring to mind at present. 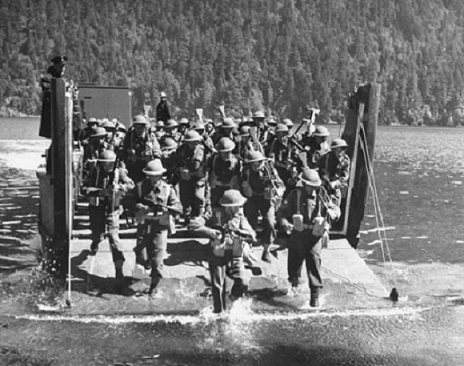 Up to 1948. 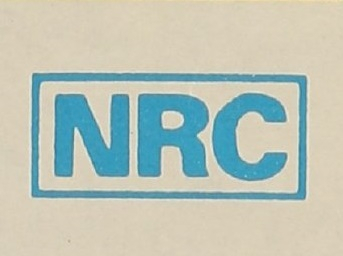 !948 -1971. 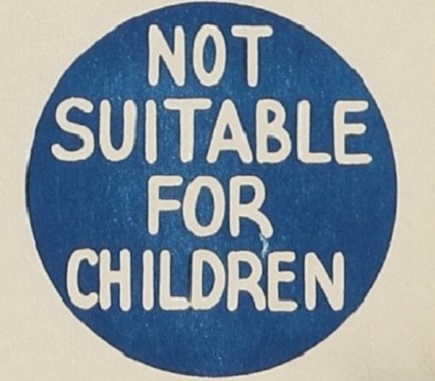 Introduced in November, 1971 to replace 'Not suitable for children'. I thought this was common back in the day. I have one. Snipe wise. Could you post your example ? Up The Down Staircase ( 1967 ). 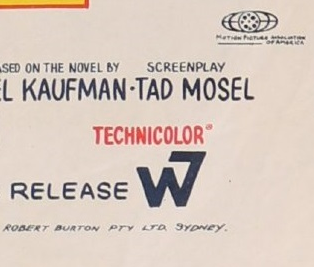 This Australian daybill, printed for New Zealand release, has something out of place. An easy one to answer surely. 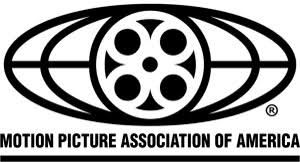 It appears nobody picked up the error here.The question here is why was a version of this logo copied onto an Australian daybill ? No idea at all..go on tell us! I have no idea why this oversight occurred. I was solely asking a question why so ? Cause it was probably just copied from a poster from the US without really thinking...like they have done so many times in the past. Most logical reason of course. 1951 Australian newspaper advertisement. Spot the error or maybe errors ? 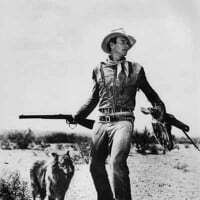 Where are the Bogie fans? It appears the Rivoli cinema owners perhaps didn't wish to spend any money on ad mats for Key Largo, so they just recycled an old image of Bogie from Sahara ( 1943 ). 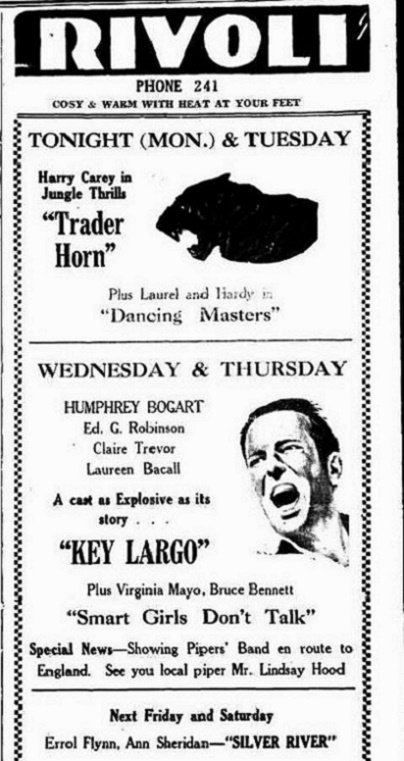 I am fairly sure the panther image appearing on the Trader Horn re-release film advertising is also a recycled image from another, and unknown to me film. 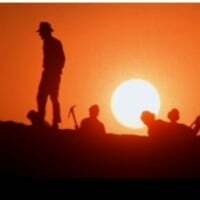 Following is the scene the used ad image was from. 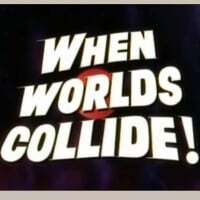 Adapting earlier film advertising to cover a current film release, for whatever reason, seemed to be a common practice with a few cinema owners I have recently discovered. 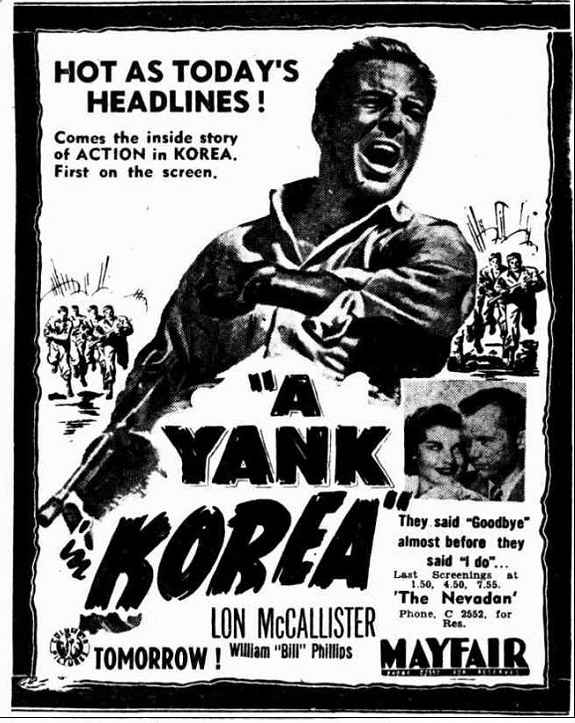 A Yank In Korea ( 1951 ) U.S.A. insert poster and an Australian newspaper advertisement from 1951 for A Yank In Korea, again using Humphrey Bogart's image from Sahara from 1943. 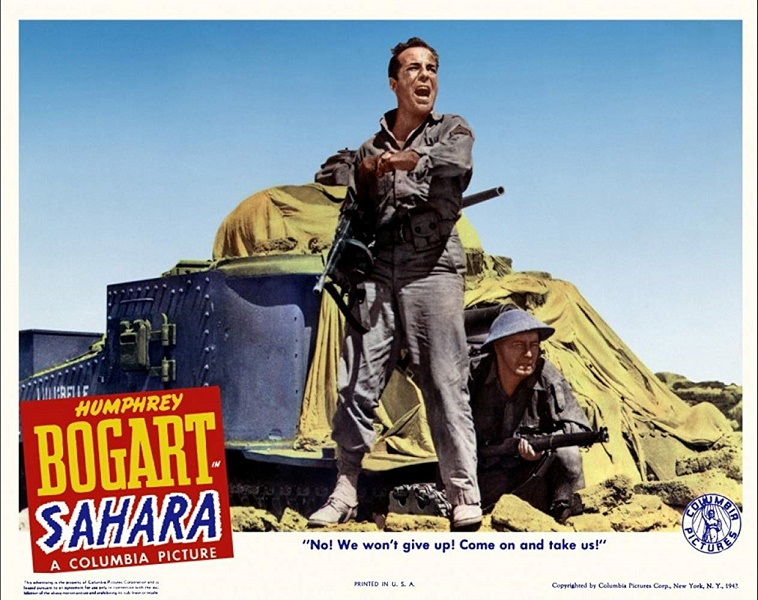 You will notice the early 1940's Columbia Pictures logo is used as well from the original Sahara advertisement. 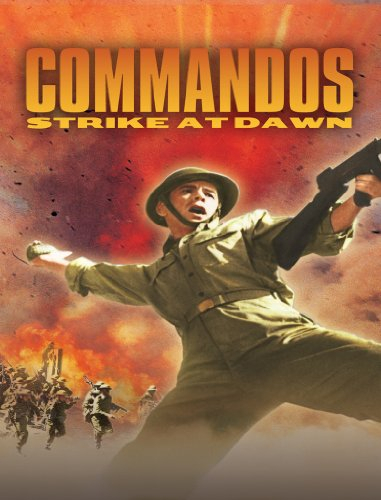 Commandos Strike At Dawn ( 1942 ) early 1950's re-release duotone daybill featuring headgear that doesn't look right. 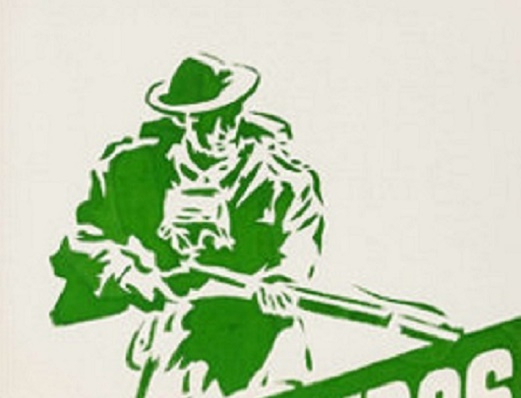 The rifle looks a little wonky too. 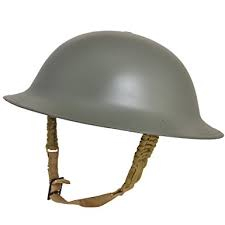 World War 2 British Army Brodie steel helmet as worn in the film. 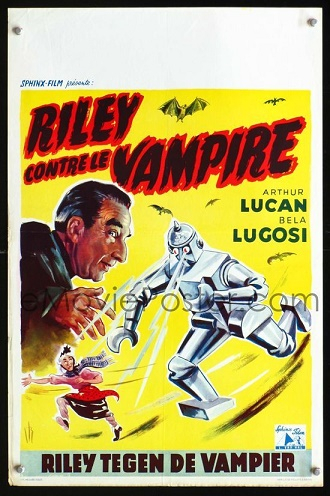 A repeat from an obscure thread from March 2015 titled ''Strange Daybill Design For Mother Riley Meets The Vampire'' that a lot of members, particularly the newer ones, may not have seen. As it is one the most blatant ripoffs that I have ever seen I thought it deserved a spot on this thread as well. 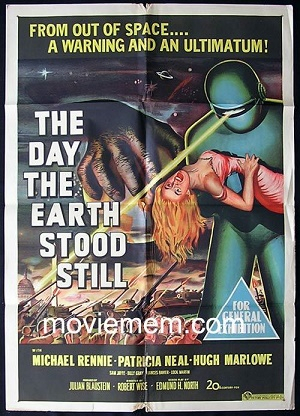 The image on the bottom right hand side of the Australian daybill is from ''The Day The Earth Stood Still'', that was released by 20th Century Fox in Australia in 1951, and the daybill was printed for it's Australian first release in 1958 by small independent distributor Ray Films.